Decade Package from the 1960's includes 3 beautifully engraved Certificates. 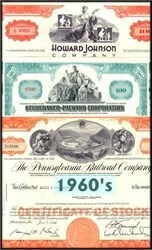 The companies included in this package are The Pennsylvania Railroad Company, Howard Johnson Company, and Studebaker Corporation. These historic documents have different vignettes and are described more fully on our website. These certificates are over 31 years old. These items sell for $39.00 if you buy them separately, but we are offering them in our 1960's GIFT OF HISTORY Decade Package for substantially less!